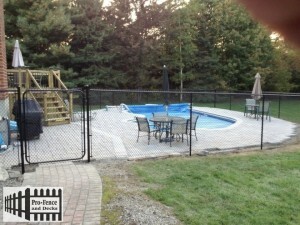 Pro-Fence and Decks Inc. Chain link Ottawa Installer/builder/contractor Ottawa. Chain Link remains a popular product for Residential and Commercial properties in Ottawa. Chain Link is known to be economical, durable, low maintenance and adds maximum protection to any property. Pro-fence and Deck offers Galvanized and color Chain Link Fence for every type of use. Chain Link height sizes start at 3’ to 7’ in height. Call us today our Chain Link specialist would be more than happy to provide you with a free estimate. All of our Chain link Fence complies with all the local codes in the city of Ottawa, Ontario.